We called it a cobblers last. 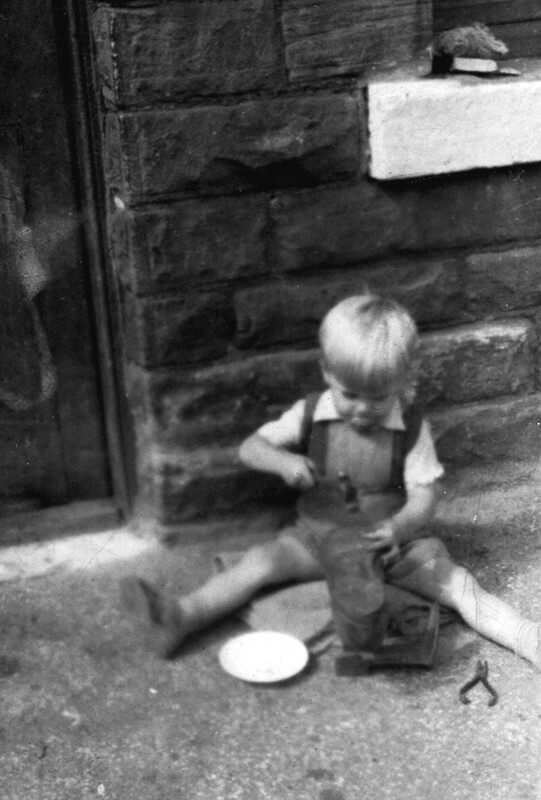 Yes, the old hobbing foot - and having taken lessons from dad, here I am in 1950. We had one, although i think we only ever used it for ensuring that our "segs" were safely knocked in place. All working class houses had one. Also that curved leather knife. Used to sole and heel shoes, knock in studs, segs, heel plates, toe plates and the old football studs! You could buy leather by the sheet, then Woolworths came up with proper sized stick on rubber soles and heels!
. You never cease to amaze me Hillsbro, man of many talents. You've hardly changed at all! I well remember Dad mending our shoes back in the fifties. I also still have a hobbing foot to use as a doorstopper. I remember my dad hving one of these. When he had a hole in his shoes, he used to ask my mum to fetch a piece of leather from the rag and tag, the sit like a little pixie on the floor mending said shoes. Hobbing Foot: I've still got one and still use it to repair my wife's shoes and my own. having the soles replaced and the boots heeled was looking at a £27 price tag. Ordered the soles and heels off Amazon did the job myself at a cost of about £11.